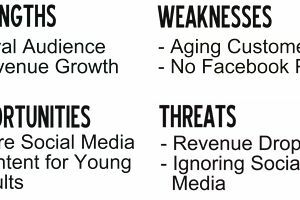 SWOT analysis sounds like some academic theory from a college business class textbook, but it's a vital way to assess your media company versus your competition. Using SWOT analysis gives you a report card to use to identify ways to improve your media product, branding, and marketing. The "SWOT" in SWOT analysis stands for strengths, weaknesses, opportunities, and threats. You should list aspects of your business under each of these categories to see places that you're vulnerable to your competition and where you have chances for growth. It is not an exercise for your entire staff to undertake. Get a few key people in a room and conduct a thorough, honest examination of how your media company compares to the competition. Simply saying, "We're the best, and no one can beat us" won't provide you with the insight you need to adapt to a changing marketplace. You should physically list aspects of your company under the four SWOT analysis categories. Some items can be put under more than one title. For instance, if your audience has been loyal for 40 years, that's a strength. But it can also be a weakness because these people will eventually die off, and your competition may be attracting younger demographics that will put them in a position of dominance in the years to come. NBC Nightly News has been number one in the Nielsen ratings. However, when news anchor Brian Williams was suspended from the broadcast, NBC had to decide if he was a strength, a weakness or both. Eventually, the network moved him to its cable channel MSNBC, possibly using SWOT analysis to determine that he was a strength for the network but a liability for its flagship newscast. Rival CBS also addressed an issue with its broadcasts. Its newsmagazine 60 Minutes is one of the most-watched programs in the country, yet the CBS Evening News remains in third place in the ratings. CBS may have conducted a SWOT analysis before putting 60 Minutes correspondent Scott Pelley in the anchor chair because he was familiar to the 60 Minutes audience. A SWOT analysis provides an action plan if you take the time to use it. That's why the opportunities and threats categories are so important. Your competition is likely doing something better than you or at least has the chance. Those threats need to be swatted down. If you work in radio and a rival station puts on a huge Christmas parade that helps it build its brand, you could counter that with a holiday canned food drive that lasts throughout December and is remembered long after the one-day parade. A local TV station that is faced with having the most popular news anchor in town at a competing station might decide to hire him, or at least get him a job in a larger DMA to get him out of the city. Make a SWOT analysis a regular part of your long-range planning sessions, and refer to these reports in the coming years to track your progress. Chances are, your competitors are already using this tool to position themselves against you.